With all the excitement of my birthday pics I forgot to tell you about my pressies! Number one son and his lovely girlfriend added to my yarn stash with some fine rainbow yarn, not sure what I'm ging to do with it yet but it crochets well. They also scoured etsy for a new steampunk necklace YAY! Isn't it cute? 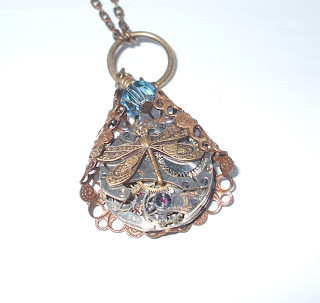 I love dragonflies, so dragonfly + steampunk is awesome. A Scandal in Bohemia which we listened to all the way home from Brighton. And Mr Nifty bought me a huge box of Thorntons Continental - we've finally found a box of chockies with minimal nuts - I'm not allergic, I just don't like them, so usually everyone else gets to eat most of my chockies. Update on my young footballing neighbour...still no banging on the fence. Best £7 ever spent!